This week Brighton Farmers’ Market will have lots of treats for holiday feasts and gifts! Andy’s Specialty Produce will have certified organic salad mix, carrots, spinach, sweet potatoes, green kale, yellow onions, red beets, green cabbage, purple cabbage, napa cabbage, daikon radishes, red and yellow potatoes, and sunflower and pea shoots. K&S Bischoping will have delicious apples including Snapdragon, Gala, Crispin, Jonagold, Ida Red, Granny Smith, and Empire, as well as a selection of heirloom apples. Fisher Hill Farm will have lots of veggies, chicken, stewing hens, eggs, and Red jacket juices; Phil and Sandi will take orders for fresh Christmas turkey and will have gift cards. Growing Family Farms will have certified organic kale, winter mesclun, purple kohlrabi, potatoes, Crooked Carrot kimchi and kraut, and Singer Farm Naturals tart cherry juice. Bristol Mushrooms will have lion’s mane, king oyster, and shiitake mushrooms, fresh picked and certified organic, and Brain Booster Powder — add it to your smoothie or favorite hot beverage to get all of the health benefits of lion’s mane mushrooms without cooking. Happy Hooves Farm is offering a Merry Christmas sale of 25% off pasture-raised heritage breed pork; Della will also have cuts of 100% grass-fed and grass-finished Hereford beef, some eggs, and raw wildflower honey; all animals are raised on pasture without soy, corn, or wheat. Stonecrop Farm is bringing fresh cuts of pasture-raised pork, including chops, roasts, sausage, ground pork, spare ribs, bacon, deli ham, ham steaks, hocks, trotters, organ meats, bones, and fat. Smugtown Mushrooms will have fresh homegrown golden oyster, blue oyster, shiitake and king trumpet mushrooms, mushroom grow kits (shiitake and oyster), medicinal mushroom tincture, and dried whole and ground reishi mushrooms. Clearview Farm will have certified organic green acorn, carnival, spaghetti, butternut, and red Kuri winter squash; dried Tulsi (holy) basil; dill; catnip; truly free-range eggs; buckwheat; organically-fed 100% grass-grown Black Angus beef including steaks, roasts, ground beef, and assorted cuts; and Genesee Valley black and cannellini dry beans. Shannon Brook Farm is bringing washable sheep hides that are tanned using a non-toxic process; certified organic broiler chickens, wholes and halves; certified organic pekin ducks; organic heritage breed pork cuts and no-nitrate smoked bacon, hocks, and hams; and grass-fed lamb cuts including shoulder roasts, legs, chops, and organically-processed sausages. Lavender Moon is bringing pre-ordered all natural holiday wreaths, soaps, salves, lotions, hot cocoa, culinary blends, and teas. Seaway Trail Honey will have certified Kosher fresh raw fall honey, a robust dark amber honey; summer honey, a pale amber honey; early summer honey, a light sweet honey derived from basswood/linden blossoms and other wildflowers; and honeycomb; cute stocking stuffers; gingerbread men honeys; mini bears; gift packs; gift bags; free wood honey dippers with 8 oz. jars; almonds, pistachios, or black walnuts in honey; new chocolate honey; spice infused honeys; and pure beeswax candles — all from the small scale, small batch apiary near Pultneyville by Lake Ontario. Wohlschlegel’s Naples Maple Farm is bringing bourbon barrel aged maple syrup; maple BBQ sauce; maple cotton candy; maple coated almonds, cashews, and pecans; traditional, cinnamon, and raspberry maple cream spread; maple mustard; pure NYS maple syrup in golden, amber, dark, and very dark; granulated maple sugar; maple garlic rub; maple coffee and tea; wheat free oatmeal maple dog treats; soft and hard sugar shapes; and body care products — maple vanilla soap, lotion, and lip balm. Newbury Park Pastries is bringing chicken pot pies and cut out cookies. R&M Bischoping will have spring, summer, and fall honey; beeswax lip balms in ten flavors; beeswax lotion bars in a variety of scents; honey soaps in over 30 scents; and turmeric tincture, made with the farm’s own pesticide-free turmeric. Flour City Pasta is bringing plenty of gift boxes and stocking stuffer flavors. Tripleberry Farm is bringing lots of traditional and reduced sugar pesticide-free berry jams, creamy fudge, hand-dipped chocolates and sugar plums, and lots of goat milks soaps, all great gifts and stocking stuffers. JonJohn’s Bakery is bringing peanut butter balls, chocolate chip cookies, oatmeal-cranberry cookies, grandma’s breakfast cake, lemon blueberry cake, and beyond chocolate cake; advance orders for holiday treats will be taken for pick-up 12/23 at the Market. Brian’s Kitchen will have traditional and gluten free/vegan cookies, chocolate fudge, and granola bars, including new pumpkin seed/chia seed granola bars. Impact Earth offers its organics drop-off service: drop off outside, pick up inside; also offered are beeswax wraps, Eco-Pul bags, reusable utensils with case, and metal straws, all great gifts for sustainable holidays. We welcome musicians Rick McRae and Friends to the Market. ColorBrightonGreen.org will collect recycling items; check here for items they are currently able to accept and recycle. Please consider donating to the Brighton Food Cupboard to support their efforts on behalf of the needy in our community. We welcome SNAP customers to our Market; stop by the Market tent to purchase tokens with your SNAP benefits card. We’re pleased to offer Fresh Connect Checks to SNAP customers. This state-funded program allows us to give a $2 Fresh Connect Check with each $5 in tokens purchased with an EBT/SNAP card, which can be used to purchase any SNAP-eligible foods at the market. 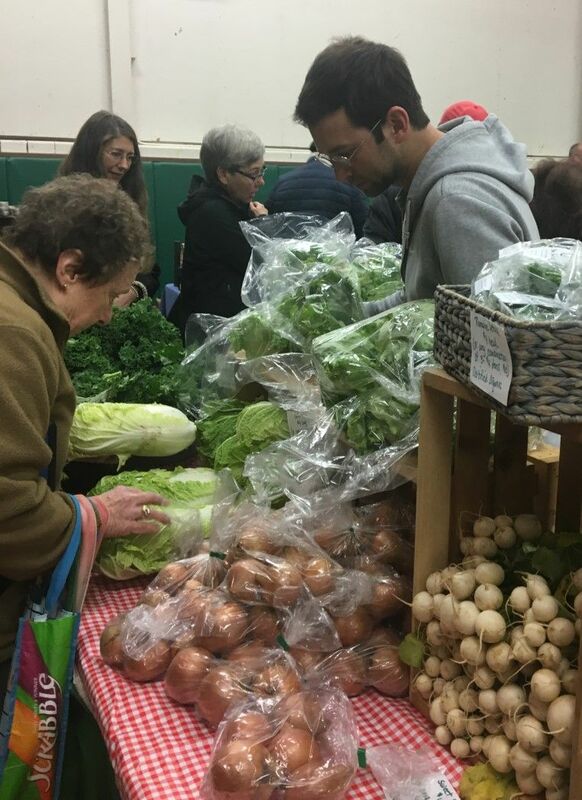 Brighton Winter Farmers’ Market is held indoors Sundays, 1 to 4 pm, in Brighton’s Brookside Center, 220 Idlewood Rd., Rochester; easy access to the site from S. Winton between Westfall and 590. The Market is sponsored by the Town of Brighton. More information about the market can be found at https://brightonfarmersmarket.org or on Facebook and Instagram.